A variety of literature is something we want our children experience. 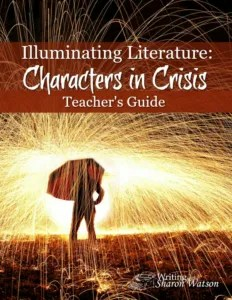 Illuminating Literature: Characters in Crisis provides high school students a thorough study of a variety of genres. Writing with Sharon Watson provided us a fantastic set of materials to use in studying literature and so far, we have been pleased. Sharon Watson created Illuminating Literature for high school students, though we are using it with our 8th grader (13 years old). Illuminating Literature: Characters in Crisis is a study that can be used in any year of high school and is the second in the Illuminating Literature series, though they do not have to taken in order. (We have not yet used the first of the series Illuminating Literature: When Worlds Collide.) It is a full year study/two semesters and is written from a Christian worldview. The completion of the course is worth a full course credit. Featuring full selections, the course teach over 100 literary terms and devices. Visit the website to get a complete list of the selections and the terms/devices. The course is comprised of the student textbook, a teacher’s guide, and quizzes/tests. The quizzes and tests can be taken online for free on the Illuminating Literature website. There is also a free downloadable Novel Notebook that goes along with the study and is optional. It is found on the Writing With Sharon Watson website. You will need the texts for the literature selections. Several are included in the textbook or available online and others you will need to borrow or purchase. It is recommended that you use a specific version of the texts so that page numbers align correctly and it is easier for the students to follow in the lessons. I highly recommend this. We have a copy of Frankenstein and I looked at it to see if it was usable for this. One of the questions said to read a particular paragraph on page 38. I looked and looked in chapter 1, which is where that page was in our book. In fact, I looked all the way back to the beginning of the book and about 10 pages farther into the story. I could not find it! When our recommended version arrived, I looked it up. It was in chapter 5 and 20 page numbers different. I am so glad I spent the $6 to purchase the recommended version! The student textbook is written to the student. The lessons are clearly marked, as is which story the lesson accompanies. It begins with an overview of the course and follows that with a lesson on character labels and forces of antagonism. These are pretty big concepts and the student applies them first to a story of their own choosing that is familiar. After the introductory lessons, the student begins with “A Jury of Her Peers,” a short story. Before reading the selection, which is included in the textbook, the student is given some background on the time period and pertinent information that is helpful for reading the story. After the reading, the student is asked to rate the story for themselves, do some work in the downloadable Novel Notebook, and then apply some of the literary terms and character labels that were learned in the opening section. Students take a quiz on the story and another on the literary terms, then hold a discussion about the story using questions included in the textbook. Finally, the student selects a project to complete as a response to the story. Frankenstein will work much the same way. There are a couple of differences. There is a section that gives the student some information to help in the reading, chapter by chapter. The questions for discussion are also listed by chapter and there are a lot of them. So many, in fact, that it is recommended the teacher pick some. At the end of the lessons on Frankenstein, there is a book list of other titles that are similar. The textbook is where the student writes their answers and ideas, where the background information is found, and where the introductory and follow up materials are found. There is also a week by week schedule for the student to follow, if you choose to use it. It is an essential part of the course and quite well done. Downloading a sample of the textbook will be very helpful for seeing what it looks like. The Teacher’s Guide has been terribly helpful. I struggle, as does my daughter, in applying some of the deeper thinking ideas and answering some of the questions. The Teacher’s Guide gives me a place to start so that we can delve into some of the ideas and explore their value in relation to the selection. The guide is well-marked and it is easy to find what is needed. The chapters, lessons, and questions are all marked to correspond to the Student Textbook and the Novel Notebook. The Teacher Guide includes key themes that are specific for each story. Along with the weekly schedule, the guide includes most of the information that is in the student textbook. It gives plenty to know what the focus of each lesson in the chapter is on and to help you guide the students. Each of the discussion questions and the Novel Notebook questions have answers to go along with them. At the end of each chapter, there is a rubric for that particular selection that makes it easy to assign grades. One neat feature of Illuminating Literature is that the quizzes and tests are all available online. The student logs in and takes the quiz and it is graded. The grade is then sent to whatever email the student logs in with. However, that is not always the best way and so there is a Quiz and Answer Manual available for purchase. This has blank quizzes that can be copied within a single homeschool as needed. The book also has an answer key in the back that includes answers for each of the quizzes in the book. The Novel Notebook is available from Writing With Sharon Watson as a download from the site. It is another way to delve into the story. It includes questions that help the student explore the meaning of parts of the story and characters, as well as helping them move through the novels a bit at a time. Throughout there are questions that help the student apply an idea to their own life or to someone’s life around them. It helps the student to personalize the story and ideas. Some of these were pretty difficult to answer but it allowed for good discussions. I really like having a literature program that pushes my advanced reader to think about what she is reading. I also like that this program includes some pretty challenging literature, as well as a good variety. Knowing that something different will be up next on the reading list makes it a bit easier to engage my student in the current selection if she is struggling. Because each of the selections is so very different, this review has been difficult to write. We have really only used the opening chapter on introducing character labels and forces of antagonism and the chapter “A Jury of Her Peers.” We are just venturing into Frankenstein. With each chapter being a different genre and therefore the types of questions and the application of the ideas being so different, this doesn’t feel like a very thorough review. So far so good, though, and we will be continuing to use this program. See what other families from the Homeschool Review Crew thought about Illuminating Literature: Characters in Crisis. Looking for a simple way to start our new school year, we decided that a week-long unit study would be great. 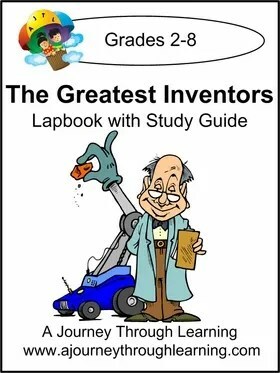 Enter A Journey Through Learning Lapbooks and their stand-alone lapbook product, The Greatest Inventors . A Journey Through Learning Lapbooks has been around for a while and got its start when a couple of homeschooling moms realized that what they wanted was not to be found. So, they created it! How’s that for ingenuity? That was the start of A Journey Through Learning Lapbooks (AJTL). AJTL has many products to fit many needs. Whether you are looking for a stand alone study or something to accompany a curriculum you have purchased, AJTL may have just what you need. And if you don’t know exactly what a lapbook is, well, they have a page for that, too. Head over to their site to watch their video about lapbooks. But quickly – lapbooking is a way to simply document learning by completing mini-booklets in different shapes and sizes, keeping the documentation varied and interesting for the student. We were able to use The Greatest Inventors, a stand-alone lapbooking unit. What that means is that the downloadable product (you can also get a printed version) contains all of the mini-booklets to create the lapbook as well as all the information in a study guide to be able to fill out and complete the lapbook. Each mini-booklet has its own page of information to read. It was a simple unit to complete and we were easily able to use it with our girls, ages 8, 11, and 13. I printed out all of the mini-booklets from the PDF file. I did not print the study guide pages; we accessed those on the computer when we needed them. I also checked out a book on each inventor from the library, since the study guide was not as high a reading level as I wanted for the two older girls. They needed more of a challenge. (The reading level was perfect for our 8 year old, though.) I placed the books and pages together on the table and the girls took turns picking the inventors they were interested in. Each day that week, the girls worked on one or more of their inventors. They read the study guide and the books. In some cases, we looked up more information or pictures on the internet with a simple Google search. Then, the girls completed their mini-booklets, as well as the book report form that is included in the PDF. The book report form is a simple form, asking for the name of the book and its author. It asks about the birth and death, the time period, and information about what was understood from the book. It also gives them a chance to be creative, designing a stamp for that inventor. It was fun to talk about stamps being a way to honor someone and their achievements. At the end of the week, we had a presentation. The girls took turns presenting their inventors, the book report, and showing the mini-booklet that was created. We also used this time to open up a discussion about how each invention helped or changed the world. It was a fun day, full of unexpected learning. Now, we went pretty far above and beyond the lapbook product itself. But this is a great example of how easy it is to extend these products to include the entire family in learning. Our oldest students got some good research experience, as well as having to present, while it fit perfectly the reading ability and interest level of our youngest. We could easily have just used the mini-booklets and the study guide and we still would have learned a lot. AJTL has simple to use products, though you do need access to a computer and printer if you are purchasing their downloadable products. If that doesn’t work for you, they have printed versions available, as well. These are just a few of the hundreds of titles that A Journey Through Learning Lapbooks has available. There is something for just about every study you can imagine. Visit their page to see what else they have. Ancient Egypt has fascinated our family since Miss E was young. When she was about four, she was playing with heiroglyph stickers and learning about Egypt. 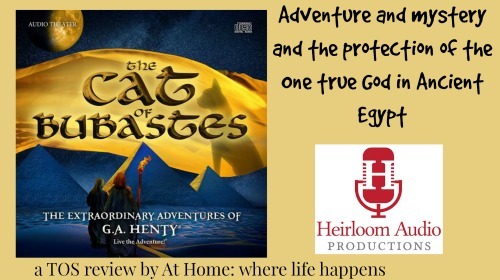 When Heirloom Audio Productions announced their release of The Cat of Bubastes, I got really excited knowing how much fascination Egypt held. We were thrilled to get to be on the review of this one! Heirloom Audio always does a magnificent job of creating a theater quality production to listen to in the comfort of your own home or the convenience of any place you can take a CD or an MP3 file. Their production crew is able to create such a wonderful program that it makes the listener feel as though they are right in the middle of the action, the discussions, and the life of the characters. Each production Heirloom creates seems to be better than the last. These items all are part of the family four-pack purchase bonuses. 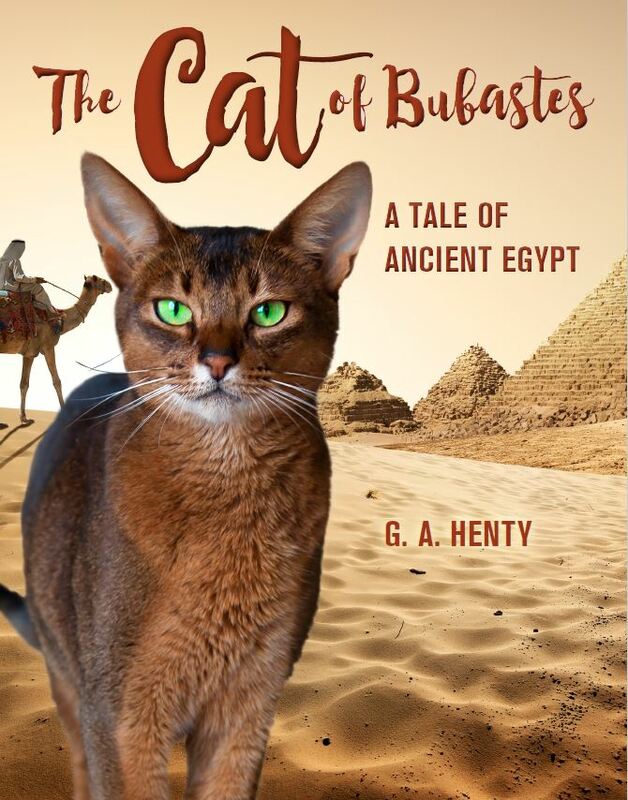 The Cat of Bubastes takes place several thousand years ago in Egypt. Many of the Rebu tribe have been captured in war and are transported as slaves to Egypt. Once in Thebes, Amuba and Jethro are placed as slaves in the house of Ameres, the high priest of Osiris. Amuba becomes friends with his master, Chebron, one of Ameres’ sons. As they learn together, they wonder about the ability of the gods and where truth comes from. In meeting an Israelite, they learn about the one true God the Israelites had worshipped in the past. Between the uncovering of a murder plot in the temple to the accidental killing of the sacred Cat of Bubastes, Amuba, Chebron, and Jethro are thrust into danger and adventure. The men experience the wonder, providence, and protection of the one true God. The CD is what we use most. It becomes almost permanently housed in Miss E’s room so she can listen to it over and over. (Well, until the next one comes out. . .) It is a 2 CD set and is done with very high quality sound. The production is approximately 2 hours long. It features the voices of Brian Blessed, Peter Moreton, Akintunde Esuruoso, Toby Baddeley, Anthony Daniels, Emily Woodward, and many others. With a score by award-winning John Campbell, the enjoyment of the story is non-stop from beginning to end. It is an easy listen and you hardly know that 2 hours has gone by when the story finally concludes. We have used the MP3 files to place the audio production on our Kindles. This allows us to listen to the program while not at home. These have the same high quality as the CDs and are easily portable. I have also placed the ebook of the original Henty novel on my Kindle. I have been able to read the book while waiting during dance classes or violin lessons. The ebook version is the original Henty novel but it has been redesigned for an ebook and has a few images added to help enhance the story. While it was slow to get started, I realized that there was a lot of information in the first part that really enhanced the story later on. Reading the ebook is something that is really quite important with this particular novel, I believe. Since the audio production is an adaptation, there is a lot of information that they are unable to include. I have learned a lot about Egypt, the society and culture, and the religion that just was unable to be added to the audio production. I highly recommend reading the original Henty novel. The study guide is a huge part of this package. The study guide contains tons of information and questions to help you get more out of the story. 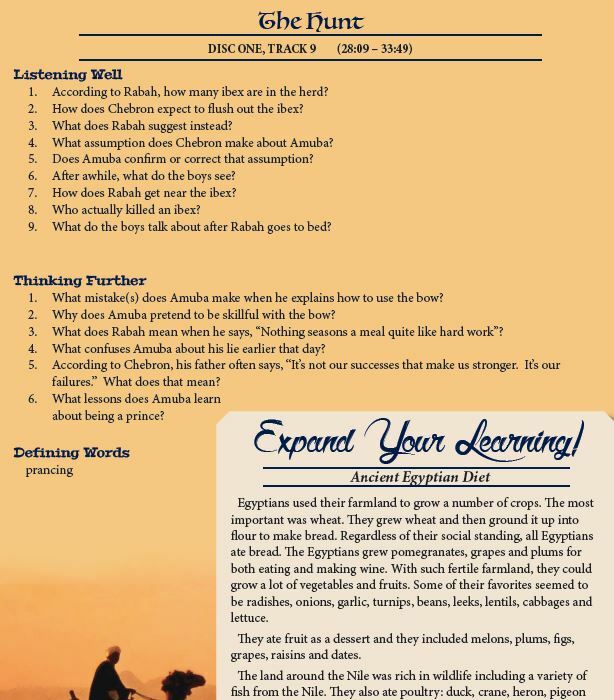 Each track has its own section of the study guide that contains questions to help the reader focus on the story and comprehending it as well as questions that force the listener to think more deeply about the content and reasoning. There are also words to define that the listener might not know. Often, there is also an information box on the page that shares more about the culture, animals, traditions, and more of ancient Egypt. Each page of the study guide has not only the disc and track number but it also contains the time markings for that track if you are listening to it on MP3, which shows and elapsed time, rather than track numbers sometimes. The study additionally contains three Bible studies: God Meant It For Good, The Knowledge of God, and Idolatry and Tyranny. There is also some additional information on the cat of Bubastes. I placed the study guide on my Kindle and we accessed it there. We used it to guide our out loud discussions about the story. The study guide definitely enriches the experience of Heirloom Audio Productions. 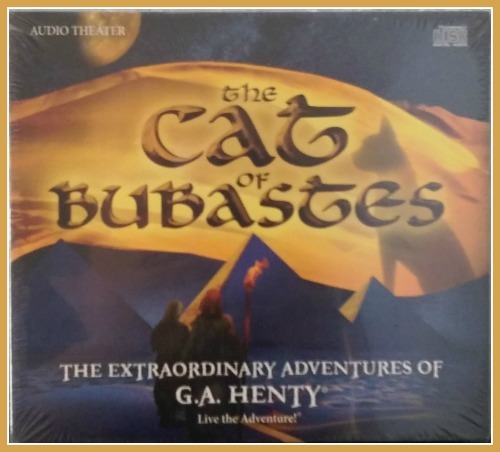 Heirloom Audio has done it again and The Cat of Bubastes is a wonderful learning experience. It is fun and entertaining, while teaching a lot. 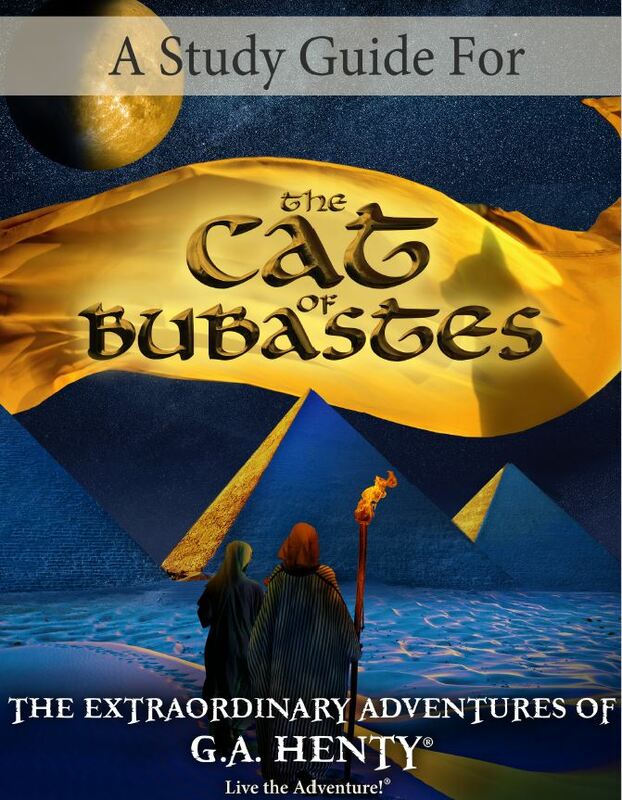 One thing with The Cat of Bubastes was that if you don’t know the story, it is hard to follow the first time you listen. Miss E remarked that she felt like she had missed a disc and actually took it out to check that it was the first disc and that it was starting on track 1. It would be good to get the background knowledge of the battle that begins the novel if possible before listening to the CDs. And, as I mentioned when discussing the ebook, there is a lot of information about Egypt and its culture and beliefs that just cannot be included in the audio production, whether due to the difficulty of writing it into a conversational style or the time factor. You really don’t want to miss that information. We enjoy Heirloom Audio Productions and get so much learning from each of their programs that I can’t help but share about them. We are grateful for the opportunity each time we are selected to be a part of a review for Heirloom. They truly are tremendous learning opportunities that are coupled with Christian values and beliefs. 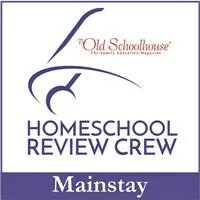 See what other families from the Homeschool Review Crew (yes – new name, same Crew!) thought about The Cat of Bubastes by clicking the banner below.